The caption on this photograph reads: "Marines discover 40 vials of suspected Sarin gas while searching a house in Fallujah, Iraq. It was secreted in a briefcase hidden in a trunk in the courtyard of the house. Two mortar tubes, three mortar rockets, compass and fire maps were also found." So here we have the WMD for which we sought, hidden in Fallujah either by foreign al-Qaeda terrorists or, more likely, remnants of the Saddam Hussein regime that knew where to get them. I'm no expert, but I think that 40 vials of this chemical could ruin the day for thousands of Iraqis, American troops, or people anywhere in the world that the terrorists could reach. This picture appears to answer George Bush's critics, and it shows that a lot more of this material is still probably floating around in Iraq. It demonstrates the critical necessity to reduce all of the "insurgent" strongholds as quickly as possible, before someone gets the chance to use it. As Trunk notes, check out the German and Russian labeling on the sarin packaging. Why do we still concern ourselves over whether they approved of deposing Saddam Hussein? UPDATE: Please make sure you check out the picture at USA Today, where the label is clearer. The labels do not say 'ANTIDOTE', nor is it packaged the way an antidote would be. 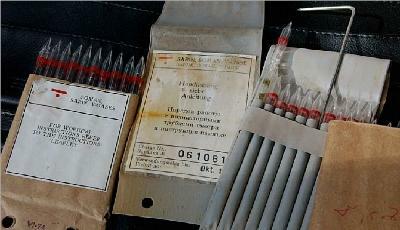 Antidotes to chemical weapons are typically stored in syringes, ready to use instantly. Considering the labeling, I doubt that these are Iraqi nerve agents. If not, though, then why are Russian chemical weapons being found in Iraq? Or, are they German? (Ruh, roh!) What could be the designed purpose of such a kit? Surely not, "Give these a try, and see if you like them." Possibly live-agent training for chemical warfare personnel, but why the variety? I don't think that this is the "look at what Sadaam did!" smoking gun that we'd like, but it's not a good thing to find in the enemy's hands, either. UPDATE IV: Even more smart readers in comments now pretty much agree that these are testers of one sort or another, probably dating back into the 80s, and not deployable sarin. As Peyton said, it does get one wondering why they felt the need to retain these testers.